Chandigarh, 13 February: Panjab University added yet another chapter to its success story as the School of Communication Studies today, saw formal inauguration of University’s Community Radio, ‘Jyotirgamaya 91.2’ and foundation stone laying ceremony of ‘Educational Multimedia Research Centre’ (EMMRC), with honourable Minister of Information and Broadcasting, Ms Ambika Soni gracing the occasion. Soon after inaugurating the radio station honourable minister and the Vice Chancellor, Professor R.C.Sobti went on-air with student RJs . When asked about her opinion on the role of the public broadcaster in the era of market driven journalism, Ms Soni said, “Public service broadcasters promote diversity and pluralism in a number of ways. Because they are not driven by market pressures, they can produce programmes which cater to a wide variety of tastes and groups, without necessarily requiring commercial viability”. Student RJs also asked the VC, Professor Sobti about his vision for the PU Community Radio and the proposed EMMRC, to which he replied, “Community broadcasting plays a major role in fostering digital literacy. It provides a dynamic way for people to participate in the life of their community”. He further added, “PU community radio would lay stress on service for the community and a distinct approach of ‘Jyotirgamaya 91.2’ would be to help blind students by preparing audio study material for them and educating the less privileged members of the society”. Professor Sobti in his introduction about the radio and the proposed EMMRC outlined the Community development functions that the PU Radio will undertake and also acquainted the dignitaries present with the mission of EMMRC which will be one of the 18 media centers established with the help of the University Grants Commission to produce Educational Television (ETV) and e-content programmes for college students. 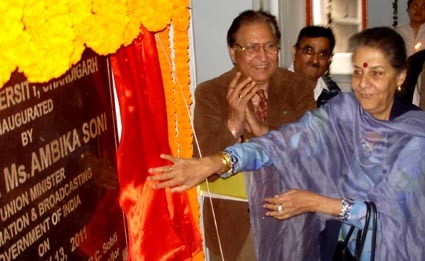 This was followed by Ms Ambika Soni presenting her inaugural address where she not only appreciated the efforts of the Department but also promised that on her return to Delhi, she would make efforts to increase the capacity of the radio from 6 kms reach presently, to about 25 kms reach. The audio study material for the blind, which has been prepared by the SCS students, was also released to blind students by the Honourable minister. Dr. Archana R. Singh, Chairperson, School of Communication Studies proposed a vote of thanks, wherein she thanked the minster for all that she had been doing for the media fraternity, including the efforts to curb piracy, doing away with the additional service tax for the entertainment industry, setting up of the National Centre for Animation and Gaming, setting up a National Heritage Mission, Museum of Indian Cinema, encouragement for more FDI in radio and news sharing amongst public broadcasters.